Users who prefer or need a wireless mouse can benefit from Evoluent ergonomics with the Evoluent VerticalMouse 4 Wireless. All of the features and benefits of the Evoluent Vertical Mouse 4 are avaialable in the Wirelss model. Sporting Dark Metallic Blue buttons to identify it from it's wired cousins the wireless model has all of the same Specifications and features combined with the convenience of being cordless. * Currently the Left hand VerticalMouse4 and VerticalMouse3 Wireless models are available only in the Regular size. Wireless Transmitter/Receiver: The wireless transmitter and receiver do not interfere with your mousing abilities, as the 2.4 GHz radio frequency allows minimal interference between transmitter and receiver (with 30' range), and the receiver itself (USB) is slim and compact, avoiding blocking adjacent ports. Long Battery Life: The two AA batteries required to operate the wireless mouse will last up to 3 months of regular usage. The sensor never sleeps so pointer response is always instantaneous. Relaxed Handshake Position: The ergomically contoured shape supports your hand in a natural handshake position that eliminates forearm twisting. You use the same familiar grip as with an ordinary mouse, but in a near-vertical orientation, so almost no retraining is needed. Clicking the mouse buttons does not result in unwanted movement because your thumb naturally opposes your finger movements. 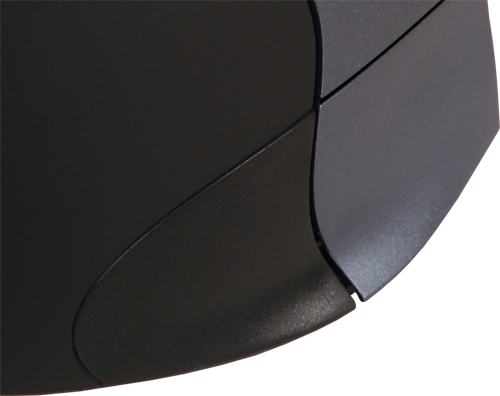 Contoured and Textured: The contoured black portion of the body where you hold the mouse has a polyurethane coating, allowing you to have complete control of the mouse just by resting your hand on it — practically eliminating the need to grip the mouse. Light Tactile Buttons: The buttons on the VerticalMouse take about half the force of traditional mice to click, so your fingers won't get tired with all the clicking required in today's computer applications. The button force is light for easy clicking, but still firm enough to avoid accidental actuation. Optical Scroll Wheel: The vertical scroll wheel is optical, providing improved reliability and quiet, smooth operation. Detents provide useful tactile feedback when scrolling. 5 Buttons: The VerticalMouse provides a total of 5 buttons. A thumb operated button and 3 finger operated buttons are provided. Also, the scroll wheel provides a fourth button at your fingertips. 1200 DPI Optical Resolution: A high quality optical sensor tracks better than many wireless laser mice so you don't waste time chasing the pointer. The 1200 dpi true hardware resolution moves the pointer more quickly to reduce unnecessary movement. Finger Flange: A small ledge along the bottom right edge of the mouse prevents your little finger from dragging on the work surface. Speed Toggle: Cycle through as many as 3 pointer speed settings with a keyboard shortcut or mouse button. For example, use a high speed for moving between monitors, a medium speed for ordinary tasks and a slow speed for graphics work. Compatibility - PC: See also the compatibility table. Includes driver for XP 32 bit, Vista 32 bit and Win 7 32 bit for programming all 5 buttons. The driver is not required. The VerticalMouse 3 Wireless still has basic functionality without it. 2 buttons in OS X or newer without a driver. Compatibility - Linux: No driver is supplied. At least left and right click are supported by most Linux versions. 5 buttons in XFree 4.0.1 or higher and Knoppix Linux 3.9 or higher without a driver. Be sure to uninstall any previous Evoluent or VerticalMouse driver and any other mouse driver before installing the driver. 1. Double click the mouse icon on the taskbar to open Evoluent Mouse Manager. 2. Pull down the button function menus to select the functions. Freeware driver for Windows Vista 64 / XP 64 / 2003 / 2000. Programmable driver functions: To see a list of all the programmable functions for the VerticalMouse 2 (wired) & 3 (wired and wireless) click here. Interface: USB only; not compatible with PS/2 adapters. May be compatible with some USB KVM switches but it is not guaranteed.